Chewy or crispy? If you’re in the camp that prefers a chewy oatmeal cookie recipe over a crunchy one – and want baking tips to get you there – then read on. In cookie dough, more flour to liquids ratio produces drier dough and a more crumbly cookie, as in shortbread. Less flour to liquids ratio produces a moister, cakier cookie (with dough that is batter-like), as in brownies. Drop cookies, like oatmeal cookies, fall in the middle of the field. But here’s the rub: the typical oatmeal cookie recipe calls for less flour than its other drop cookie counterparts. That’s because oatmeal adds a good deal of the bulk. This flour-oatmeal mix presents unique circumstances for the chewy cookie lover. How can you get the chewy cookie you prefer when the dry ingredients are so bulky? A cookie’s texture largely depends on how much the dough spreads before the structure sets during baking. Too much spread means the cookie will be flatter and crispier. Too little spread means the cookie will be rounded and cakey. So the tip is to tweak the oatmeal cookie ingredients and tweak baking time to get just the right spread … and a chewier result. The four basic ingredients in cookies – flour, fat, sugar, eggs – impact an oatmeal cookie’s spread and chewiness. Experiment with these tweaks to get your optimal chewiness. All-purpose flour allows the most even spread on cookies, but its high protein content produces cookies that tend to be flatter, darker, and crispier than their counterparts made with cake or pastry flour. Herein lies a tension. Do you want to rely on an even spread you’ll get with all-purpose flour – sure to be crispier– or experiment with the type of flour you use? Most oatmeal cookie recipes call for all-purpose flour, but you may wish to try cake flour (less protein) to achieve the chewy oatmeal cookie recipe of your dreams. Most American-made butter and margarine is 80% fat and 20% water (In Europe, butter can contain up to 85% fat and just 15% water.) The water-fat combination means that butter and margarine let off steam while cooking. These fats also melt at a lower point than shortening, meaning sooner in the oven. That allows for more evenly-spread cookies … but faster spread. If you want to experiment with fats to make chewier cookies, melt the butter in your recipe before mixing and add a tablespoon extra flour. Or try using 100% vegetable shortening. This may be sacrilege to some who are unwilling to sacrifice the flavor of butter. But keep in mind that shortening is 100% fat. Its higher melting point means it stays solid longer. To compensate, flatten the rounded drops of cookie dough with the heel of your hand. They will bake more evenly but the shortening will take longer to melt, leaving a chewier, softer cookie. Brown sugar retains more moisture during baking than granulated sugar creating a softer, moister cookie. Try adapting your oatmeal cookie recipe to use more brown sugar than granulated sugar. And don’t despair when your kitchen is humid. Sugar attracts moisture, which can make a softer cookie. 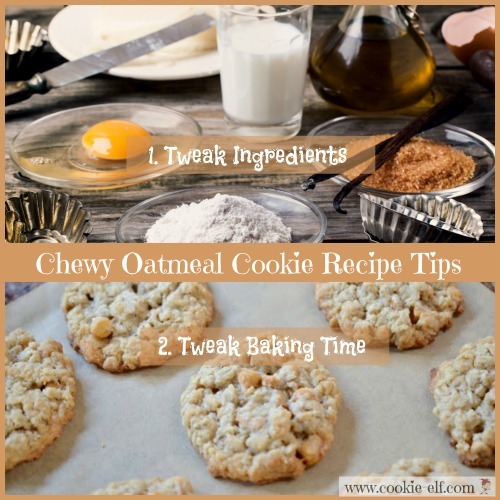 Take note of these tips to use in your chewy oatmeal cookie recipe. Did you ever notice how your cookie recipe has a suggested bake time range? It reads, “Bake 9-12 minutes” leaving you to wonder if you should bake the cookies for 9 minutes or 12 minutes … or 10 or 11. Even if you take into account that ovens are different, the bake time range allows you to choose a texture. If you prefer chewy, soft cookies, try under-baking your oatmeal cookies by a minute or two. This is by far The Elf’s favorite tip for softer, chewier oatmeal cookies. You may need to experiment to get the best baking time for a chewy oatmeal cookie recipe over a crispy one. Allow your cookies to sit on the cookie sheet for several minutes before using a spatula to remove them to a wire rack to cool completely. This is especially important when you choose a shorter baking time. By allowing cookies to cool for a bit, you’ll give the eggs a chance to work their magic on building structure, giving the cookies a chance to set and retain their shape. Soft cookies stay that way because they retain moisture. Once cookies are completely cooled, store them in plastic, sealed containers so they don’t dry out quickly but stay chewy longer.